In her first book under the Llewellyn imprint, New Paths to Animal Totems: Three Alternative Approaches to Creating Your Own Totemism, Lupa set out three methods of connecting and working with animal totems: the Correspondences model, the Bioregional model, and the Archetypes model. 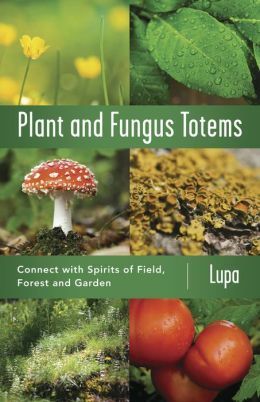 In her new book, Plant and Fungus Totems: Connect with Spirits of Field, Forest, and Garden, she shows how these same three pathways can be used to connect and work with the totems of plants and fungi, as well. She points out that the way plant and fungus totems respond and communicate, and the way we perceive our interactions with them, are slightly different from the way we interact with animal totems: not only are most plants and fungus stationary — literally rooted where they stand, for the most part — but also that, although they mostly grow out of the earth, their major need is for sunlight, rather than soil. The standard tendency to consider plants as “of the earth” is true, but it’s equally true to consider them as creatures of sunlight. The first chapter deals with the question of precisely what plant and fungus totems are; chapter two discusses how they are different from animal totems. Chapter three is where the different model system descriptions are, beginning with Bioregional, moving on to Correspondences in chapter four, and then the Archetypal model in chapter five. Chapter six discusses ways to combine these models — two at a time, or all three. Chapter seven deals with the “relics” of the plants that the totems are about: dried leaves, flowers, roots, seeds, and fungi caps; this parallels the discussion of animal relics such as skins, furs, horns, antlers, shells, bones, skulls, and feathers. The final chapter in the book discusses ways in which we humans can give back to the plants and fungus totems that we work with, in the same way that we can give back to the animal totems we work with. After that, there are several indices, a glossary, and a bibliography. The book is laid out along the same lines as New Paths to Animal Totems, well-organized and easy to follow. Scattered throughout the chapters are a number of exercises to practice which are meant to help you expand your understanding of, and connection with, the totems you work with. The author recommends you read through the entire book before starting the exercises, so you have a clearer idea of the ideas and practices you’ll be performing. Not only are these exercises written so that it’s easy to understand them, they provide genuine insight into the totems that you are working with, and both broaden and deepen your connection with those totems. Plants and fungi are further away from our understanding than animals are; for that reason, they are very often overlooked by those practitioners who seek to connect with totems. Those things that humans find difficult to understand — and, in a sense, identify with — are things that are often perceived as being of less (or no) value. But in reading this book, it becomes possible to gain a greater understanding of the plants and fungi whose totems these are; empathy is born of that understanding, and that connection is of great intrinsic spiritual value to both humans and the plants and fungi discussed in these pages. Not every pagan or polytheist is interested in totems and spirits. But enough of them are that “finding your totem” is generally considered one of the most basic practices when an individual begins to follow a pagan/polytheist/magical path. This book, along with its predecessor New Paths to Animal Totems, approach the matter from such a clear and helpful direction that I can unstintingly recommend the book’s (and books’) inclusion into every practitioner’s library. I have yet to read a better treatment of the subject.